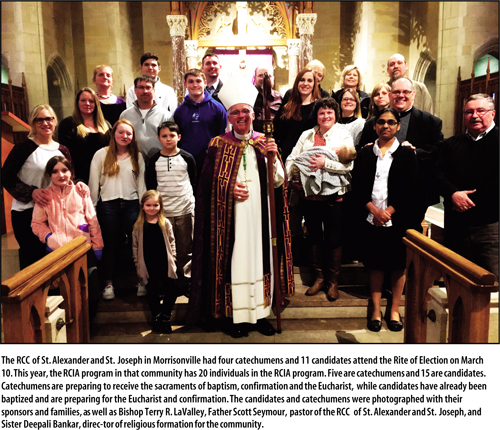 OGDENSBURG – A celebration of the Rite of Election and Call to Conversion was held March 10 at St. Mary's Cathedral for those preparing to fully enter the life of the Catholic Church. Bishop Terry R. LaValley commenced the ceremony by thanking the dozens of catechumens and candidates who braved inclement weather to celebrate their faith. It’s during Lent that the catechumens and candidates will bind their presence with the Catholic Church. The ceremony is held the first Sunday of Lent and is considered a key milestone in the Rite of Christian Initiation of Adults (RCIA), a gradual process of conversion and initiation into the Catholic Church. Addressing the catechumens and candidates, Bishop LaValley reminded them that the sacrifices made during Lent mirrors the fasting and abstinence Jesus endured during his 40 days in the desert. Bishop LaValley had an opportunity to meet the catechumens and candidates from parishes around the diocese and support them on their journeys to the Catholic faith. 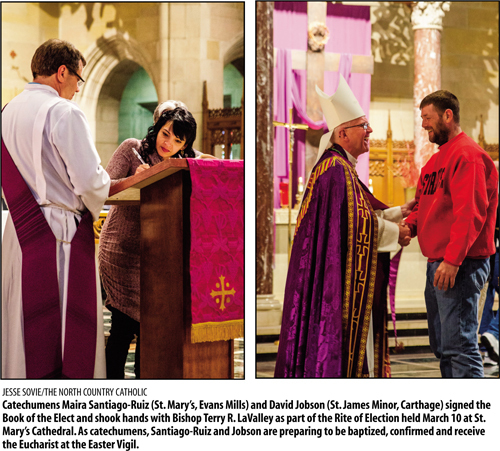 During the Rite of Election, parish RCIA directors presented 20 catechumens to the bishop. Then, one by one, the catechumens signed their names in the Book of The Elect, strengthening their commitment and discipleship to their new faith. Bishop LaValley then declared them members of the Elect, moving them forward in preparation for the Sacraments of Initiation of baptism, confirmation and First Holy Communion at the Easter Vigil. During the Call to Continuing Conversion, 25 candidates who are already baptized Christians were affirmed by their sponsors and the assembly. With Bishop LaValley’s acceptance, the candidates will take the next steps toward being in full communion with the church. For some, the Rite of Election and Call to Conversion was an emotional step forward in the RCIA process. Ruiz said the process has not been overwhelming, crediting her sponsors. “They have taken their time to give me all the instruments I need to keep my faith,” she said. For Arthur Jobson, a catechumen from Our Lady of the Sacred Heart Church in Watertown, converting to Catholicism meant being closer to God. Preparation through the RCIA program covers Church history, the sacraments, learning to read Scripture, prayer and personal testimonies. The Bishop thanked the pastors and sponsors who are shepherding each catechumen and candidate through the process. The Easter Vigil takes place on Holy Saturday, the evening before Easter Sunday when the catechumens will be presented to the parish community. The catechumens are then baptized and confirmed with the candidates. Finally, the new members of the Catholic Church will receive the Eucharist for the first time.